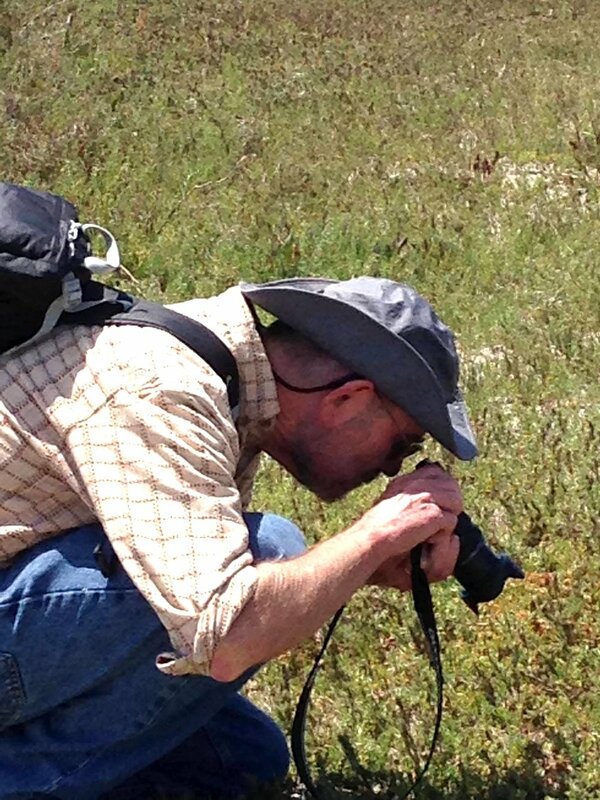 Craig Denson is a chapter volunteer with our annual Native Plant Sale and pursues California native botany through courses, his own field explorations, and his garden. His garden, 'Coastal Sage Scrub Revivified' will be on this year's Garden Tour as an FYI (Front Yard Inspiration). When you visit the garden you can see an evolving effort there, with an attempt to emulate 3 zones of local coastal sage scrub: (1) a drier, more open area with dudleyas, bulbs, and annuals occurring in openings in coastal sage scrub; (2) a grassy meadow-like area in front of that with annuals and some perennials; and (3) some denser perennials and shrubs. What spurred your interest in gardening with California native plants? Initially, I just wanted to get rid of my lawn in the interest of lowering water usage. The first attempts included native and non-native bulbs, all of which were eaten by gophers. There was then a series of more or less successful natives including Gambelia, Monkey Flowers, Yerba Mansa (! ), and Wild Flower mixes. Also, because I’ve spent a lot of time in the Sierras and S. California mountains, as well as the desert, I wanted to bring some of the wild look home. You’ve mentioned to me that many of your plants were grown from seed. What do you see as the advantages to this approach as opposed to starting from nursery plants? Growing from seed is based on two factors, the first is that I want annuals that simply aren’t available otherwise. The second reason is that, with the permission of local park rangers, I can propagate local native varieties. In looking at your garden, there are many locally endemic species. Was this a deliberate approach you took and what was the most surprising result of it for you? This was absolutely intentional and began with a collaboration with the Tecolote Canyon park ranger to collect and propagate natives from the canyon to feed restoration efforts there. Among the first seeds I propagated were Ceanothus verrucosus, a CNPS 2B.2 plant, from a remnant Tecolote Canyon population. Most of the plants are not necessarily endemic, but are naturally occurring in Tecolote Canyon, including two lupines, California Sand Aster, Toyon, and Eriophyllum confertiflorum. Since the first two plants I tried to germinate were Cneoridium dumosum, and Ceanothus verrucosus, I thought cold stratification was the way to get all the local species started. That turned out to be laughably wrong for many others like Corethrogyne filaginifolia, Isocoma menziesii, and Dichelostemma capitatum, which germinate at ambient temperature almost immediately after gathering them. You have in the front what some would generically term a ‘wildflower meadow’. What factors contributed to establishing such a large, tightly-knit grouping of plants? The intentional factor was that I wanted to bring some of the wildness I found while hiking and wandering back home. The fortuitous factors arise from the fact that I have a relatively small space, and I keep trying to put more of my ‘favorite’ plants in it. Some of those plants then have different ideas about how much space they need. I really have three native weeds in my yard at this point: California Poppies, Elegant Clarkia, and California Fuchsia, competing for space. I say weeds, because these plants will spread everywhere, including places where you would like other plants to be. The native grass is also a strong competitor, so, where these plants run into each other, it’s a dense, natural looking setting. In the spaces, some of which I need to enforce with selective weeding, some of the other, smaller plants find a bit of breathing room. Cool insects/pollinators that have visited your garden? Hummingbirds visit the Calliandra californica and Peritoma arborea year-round, and the Epilobium canumin summer and fall. Recently, I’ve tried to ID insects other than honey bees that are present. There are at least three species of Syrphid flies, a carpenter bee, and, occasionally, bumblebees. Some years there have been large numbers of Sphinx Moths, although not recently. Crane Flies, aka Mosquito Hawks, love the poppies, although I don’t think they pollinate anything. What would you offer as encouragement to someone who wants to plant a California native plant garden? It’s good to have a plan, but plans can change, so try something you like and see if it works. Older PostGot Some Fire Pictures You Want to Share?